All IEH PCR test kits are available in two formats. The Screening Test is highly sensitive and is designed not to result in false negatives. This is achieved by multiplexing several genetic targets for each pathogen. The positive screening results can be reported as presumptive positive, Initial reactive, or any equivalent accepted terminology. The IEH Listeria monocytogenes. Test System (IEH Listeria Test) is designed for use by laboratory technicians with proper aseptic techniques needed to perform DNA amplification-based assays in a biosafety level 2 laboratory environment. The IEH Listeria Test allows rapid detection of Listeria monocytogenes. in foods such as raw meats, RTE products, leafy greens and environmental samples. 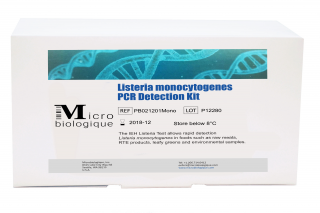 The IEH Listeria Test simultaneously detects the presence (or absence) of Listeria monocytogenes. Specific fragments of the bacterial DNA, which are unique to the target organisms and not present in other bacteria, are amplified using DNA polymerase. A positive result for either pathogen in food is an indication that it may be unsafe for consumption, and that appropriate protective steps should be taken.